This is the eighth excerpt form Meadow Bank W.I. Tweedsmuir History published in 1951. There are multiple family names referenced in this piece. We only highlighted a few in the title. On the next farm lived the MacLeods who came out from Scotland about 1830. In this family were three sons: Alexander, Murdock and John and two daughters: Margaret, spinster; and Mrs. Robert MacMillan of Millvale. Since the death of Murdock, the farm has been owned in turn by Will Henderson, Cecil Scott, Wilfred MacLeod, Mr. Kennedy and now (1951) by John Miller who in 1928 emigrated with his wife and family of seven boys from West Calder, Scotland. Of the farm that Norman MacFadyen now owns the first we know is that a Captain MacDonald owned it in 1840. (Captain Gore’s deed to Andrew Cody of farm to the west) then Duncan Patterson. His two sons, Duncan and Charles lived here, the former operated the farm while the latter had a blacksmith forge on the roadside. Wallace Patterson is a grandson of Duncan Senior and is now a jeweller in Charlottetown (1951). The Pattersons sold to Bob MacMillan who later sold to Neil Ferguson from when the present owner bought. Continuing west we find that in 1840 one Captain Gore sold to Andrew Coady 100 acres for £116, 13d. He was married to Rosie McAtter, their three children were Mary Ann, Ellen and Andrew II. It was sold to Robert Boyle May 4th, 1896. In August 23rd, it was deeded to George H. Boyle, son of Robert. The farm is now owned by Gordon Boyle. On the South side of the road some distance West of what is now called Boyle’s Creek, on a small corner of the Coady farm, lived Matthew Boylan, labourer, and his wife Mary McAtter, sister of the aforesaid Mrs. Coady. Their two sons were Patrick and Terrance, the former was a plasterer in Charlottetown, the latter moved to the Western part of the Island. The next farm originally Capt. Gore’s Property was owned by John Boyle who for a time lived with his family at Cornwall on or near the farm now (1951) owned by Leigh Good. 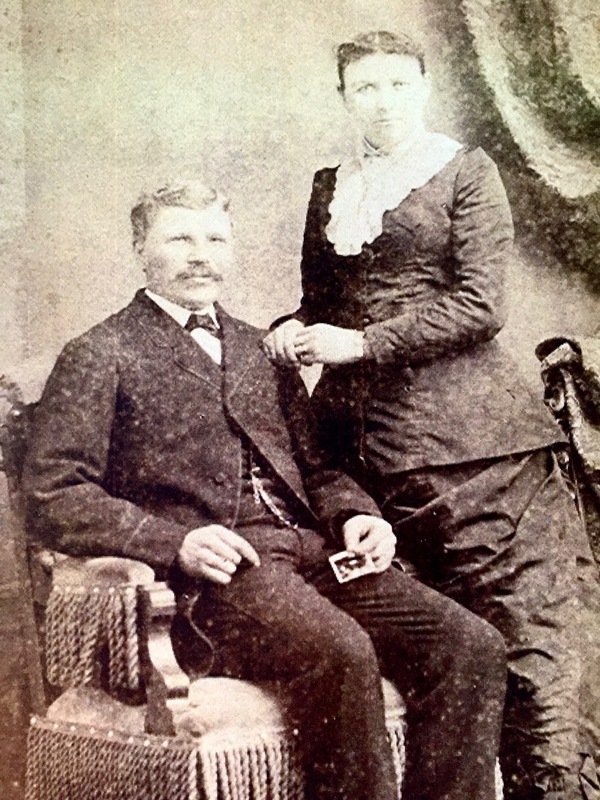 In John Boyle’s family were Michael and William and two daughters, Mrs. Angus MacEachern and Mrs. James MacLean. William moved to Charlottetown and operated a tannery on Spring Park Road. Michael continued to live on the old farm where he married Miss Margaret Boyle To this union were born four sons and five daughters. One son, the late William was the subsequent owner until his death in 1928 when the property was purchased by Fred Hyde of the adjoining farm for his son Stanley, the present owner. “Edgewood”, the farm of Elmer Hyde consists of 125 acres and was purchased from George MacEachern, son of Angus, by Henry Hyde and willed to his son Frederick in 1896. The Hydes had to clear the land where the buildings now stand, the only building on the place at the time of their occupancy being the former Meadow Bank school house and now used as a workshop. The remaining 75 acres of the MacEachern farm which contained the MacEachern dwellings was later sold to Frank Boyle, the present owner. 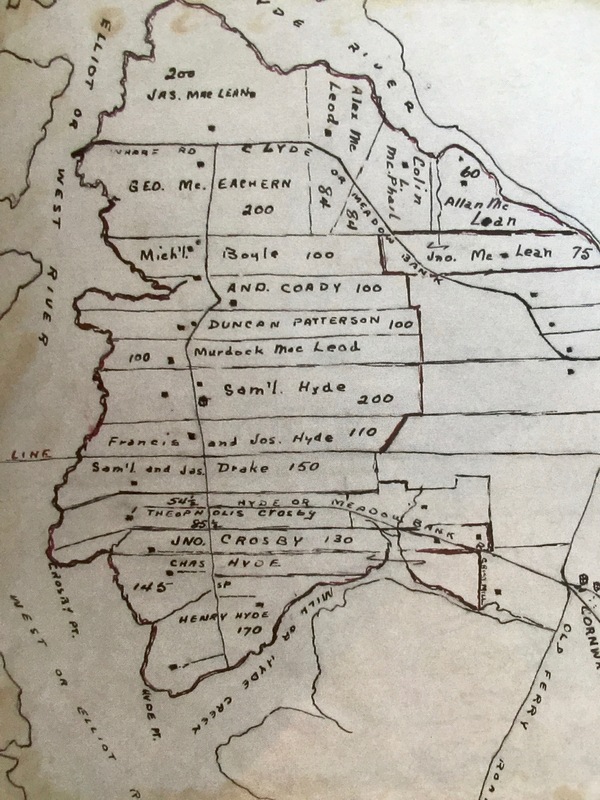 The Atlas of 1880 shows James MacLean to be in possession of the next 200 acres but this was soon after divided and Hammond Crosby bought the half next to the road and occupied it until his death in 1919 when it was bought by James MacPhail. It is now owned and occupied by his son Colin D. MacPhail (1951). The remaining part of the original MacLean home has continued in the name passing from father to son. It is now in possession of Frank MacLean.